Scores of amazing inventions for improving the technology of watercraft have been invented and forgotten since the 1920s. Here are a dozen for you to reconsider: Hydrofin, Spiral Roller Boat, Tait: Tractor Boat, Spiral Propeller, Cone Sails, Lesh: Rotor-Sail Roller Boat, Brasher: Air Bubble Breakerwater, Heudorf: Fish-Submarine, Wave-Powered Boat, Strode: Hull, Ford: Air Motor. 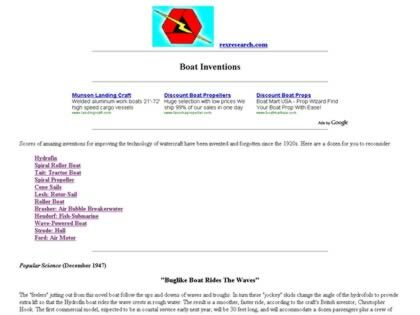 Web Site Snapshot: If available, above is a snapshot of the Rex Research Boat Inventions web site at http://www.rexresearch.com/boats/1boat.htm as it appeared when this site was added to the directory or last verified. Please Note that Boat Design Net has no involvement with the above web site; all content and images depicted in the above thumbnail are the property and copyright of Rex Research Boat Inventions unless otherwise noted on that site. Description: Scores of amazing inventions for improving the technology of watercraft have been invented and forgotten since the 1920s. Here are a dozen for you to reconsider: Hydrofin, Spiral Roller Boat, Tait: Tractor Boat, Spiral Propeller, Cone Sails, Lesh: Rotor-Sail Roller Boat, Brasher: Air Bubble Breakerwater, Heudorf: Fish-Submarine, Wave-Powered Boat, Strode: Hull, Ford: Air Motor.